We have show every Friday & Saturday, our puppet shop is open everyday, except on Sunday. One day left to catch the action at this academic meeting. 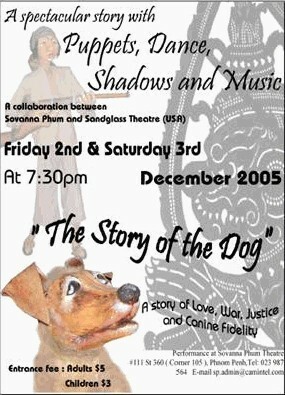 Sovanna Phum is proud to present the International Première of its new joint production with Sandglass Theater (USA) entitled “The Story of the Dog”. 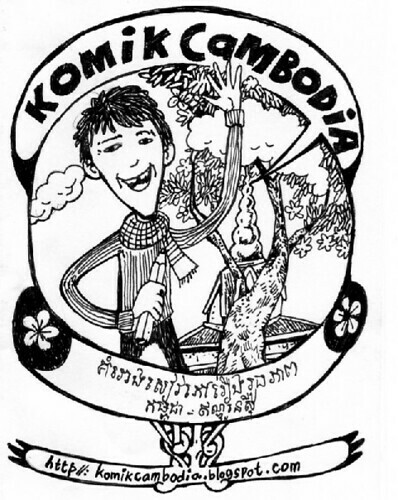 Performances will occur on December 2nd and 3rd, 2005 at the Sovanna Phum Theater, 7:30 pm. 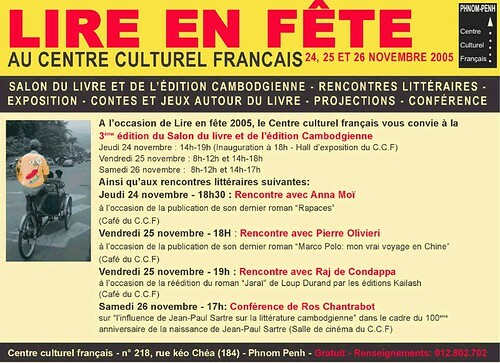 Please find enclosed the poster of the performance. Sandglass Theater was founded in 1982. Sandglass creates theater featuring puppetry and visual imagery in combination with actors and music. The company has toured in more than 25 countries worldwide, presents a bi-annual festival of international puppet theater, and teaches an intensive training workshop every summer. Sandglass is also a member of the newly formed Network of Ensemble Theaters in the United States. We are most happy to provide further information regarding the performance or our association. Please contact us at: Sovanna Phum, #111, Street 360, Boeung Keng Kang III, Phnom Penh, or contact Segolen Guillaumat, Project Manager, sp.project@online.com.kh, 012 19 086 23, or Kong Sophea, Project Assistant, 011 75 25 80. You are currently browsing the Sang Salapak Building Arts blog archives for November, 2005.